1. All singing canary birds found around the world originally started with one species, the Serinus Canaria from the Canary Island. There are some species which are no longer available, having been bred out of widespread existence. 2. 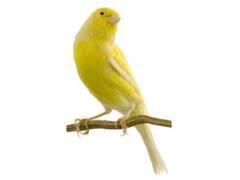 Canary bird breeders may breed for three different types of canary. The color canary is prized for the coloring, the song canary is bred specifically for a beautiful voice, and the third type is bred for some desirable physical trait or other characteristic. 3. Almost every type of canary has the capability of song, but some prefer to sing a lot more than others. Breeders who specialize in song birds use those that prefer to sing for breeding purposes, in the hopes of passing this gene along to future generations. 4. Singing canary birds are not people oriented, like most of the larger bird species are. These birds do not require personal care and special handling, as long as there is more than one bird so they can socialize together. 5. The color of the red factor canary can vary from a light orange to a brick color all the way up to a fire engine red shade. Color feeding is required to keep this species a vivid hue, and if this is not done the feathers may turn yellow when growing in. 6. There are many species of canary which were specifically bred for their song qualities. These include the Roller canary, the Waterslager canary, and the Spanish Timbrado canary. 7. Germany is famous for the singing canary birds bred in this country. While other countries choose to breed for color or type Germany specialized in breeding these birds for exquisite song properties instead. 8. Until the early sixteenth century it was not possible to find female canary birds for sale outside of Spain. Only males were sold and exported up to this point, so that Spain maintained tight control of the trade in these birds. 9. Singing canary birds were introduced to the European continent as early as the year 1478. These birds quickly became popular as house pets because of their small size, beautiful song, and docile personality. 10. Through history, ever since canaries were first available, canary bird cages have been elaborately designed and created to compliment the beauty and song of these birds. Some members of royalty even had cages designed from precious metals and gemstones for use in palaces.